A couple of days ago, I had an epiphany about retrieving. It was based on something experienced handlers do when running agility. They look in the direction they want their dogs to go vs. looking at their dogs. I thought if that works so well for agility, why not try it for retrieving. 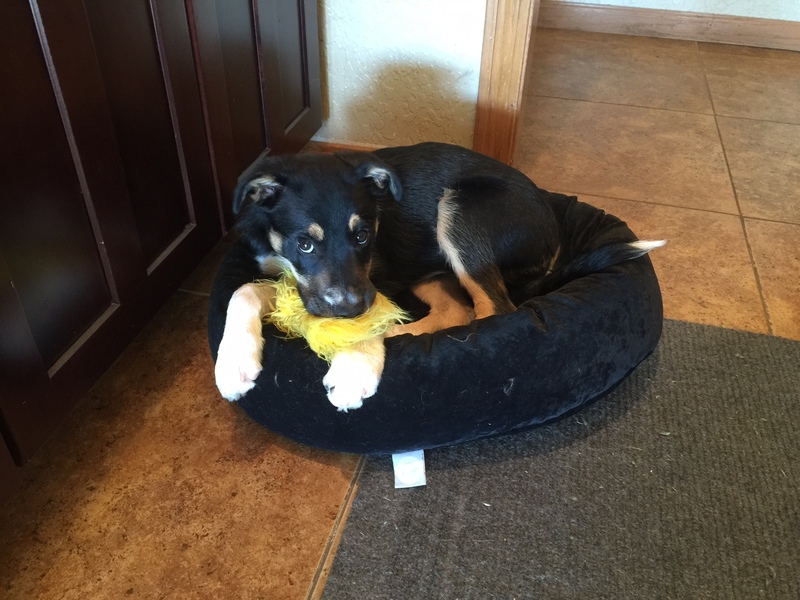 So I did a little test with Takoda and his absolute favorite fuzzy yellow chicken toy. I knelt on the floor, sat back on my heels, and tossed the toy about 3 feet away and said GET IT! which of course he did. As soon as he reached the toy I said TAKODA COME! He continued running in the direction he was heading, hopped into his bed, and proceeded to munch on the toy. This was pretty much what I expected him to do since this is what he’d been doing from Day 1. I had intentionally left the dog bed in place and set up the game so he’d be facing his bed when running towards the toy for my little test. In hindsight maybe I should not have said COME, since I knew he wouldn’t come… but one OOPSIE on my part didn’t mess up his recall, which has been pretty good lately. Anyway, there he was in his bed happily munching on his favorite toy watching me like he always does when I dropped my head down to my knees into “Child’s” pose (yoga) and waited.. not saying a word. I didn’t have to wait long (3 seconds or less) before Takoda came running over to mob me. He didn’t bring the toy but I didn’t really expect him to. However the next rep, he did bring the toy and by the time he reached me, I up-righted myself and he pushed the toy into my diaphragm. He received massive praise and playful engagement in return for that stellar performance! The third rep, I didn’t start off in Child’s pose. Instead I put my hands on my thighs, palms open and looked down on my hands. I tilted my head forward so he could not make eye contact with me. When he reached the toy, I said TAKODA COME and BINGO! he didn’t take the toy to his bed. Instead, he mouthed the toy where he picked it up and then ran back to me and pushed the toy into my chest again. Another massive praise and play session followed. I think having open palms and looking down at my hands vs. making eye contact created the motivation for him to come back to me with the toy due to his natural desire to reconnect with me. The final two reps I hid a small piece of cheese in my mouth and when he pushed the toy into me I gave him the cheese and then immediately gave him the toy back. He looked astounded by the emergence of cheese from my mouth. It was so darned cute! The last two reps were picture perfect.